Three West Liberty-Salem soccer players traveled overseas to Italy with their club soccer team to train, play and tour. Taylor Lauck, Paige Shafer and Gabby Hollar (pictured left to right in Italy) are playing in Italy with their club soccer team for 10 days. They won a 3-team tournament 2-0 and 5-0. They are training, playing games and sight-seeing with their Locker Soccer team coached by Steve Locker out of Powell, Ohio. https://www.urbanacitizen.com/wp-content/uploads/sites/36/2017/06/web1_wlsitaly.jpgThree West Liberty-Salem soccer players traveled overseas to Italy with their club soccer team to train, play and tour. 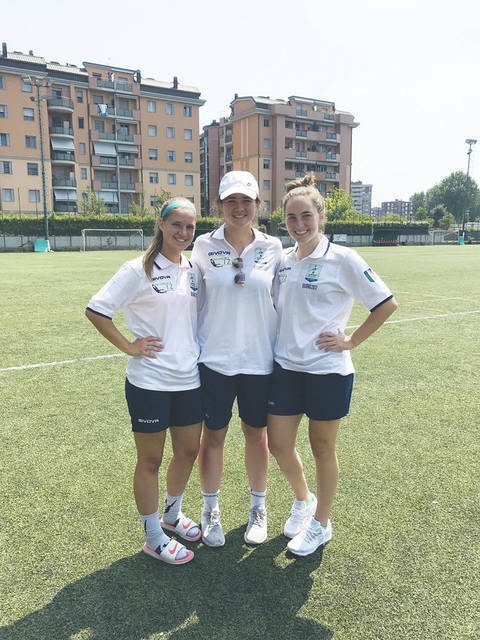 Taylor Lauck, Paige Shafer and Gabby Hollar (pictured left to right in Italy) are playing in Italy with their club soccer team for 10 days. They won a 3-team tournament 2-0 and 5-0. They are training, playing games and sight-seeing with their Locker Soccer team coached by Steve Locker out of Powell, Ohio.